It wasn’t that long ago that we were limited to one brew a day on our 15-barrel gas-fired brewhouse stationed under the antique store in downtown Blanco. Now we brew over 61,000 barrels of beer each year, utilizing a 60-barrel, four-vessel system consisting of mash tun, lauter tun, kettle, and whirlpool, with an output of 6 brews a day. Each brew day starts in the mash tun where hot water and milled grist are mixed with the primary goal of converting starches to sugars creating a sweet liquid known to brewers as wort. The mash is then transferred to the lauter tun where, with the aid of the grain bed, the wort is clarified and run off into the kettle. When the kettle is full we commence the boil. Hops are added throughout the boil to provide bitterness, balancing the sweetness of malt, and to provide the requisite flavor and aroma for each beer. At Real Ale, all of our fermenters are cylindroconical (otherwise known as unitanks), which allow the beer to ferment and condition in the same vessel before being moved to a brite tank for packaging. 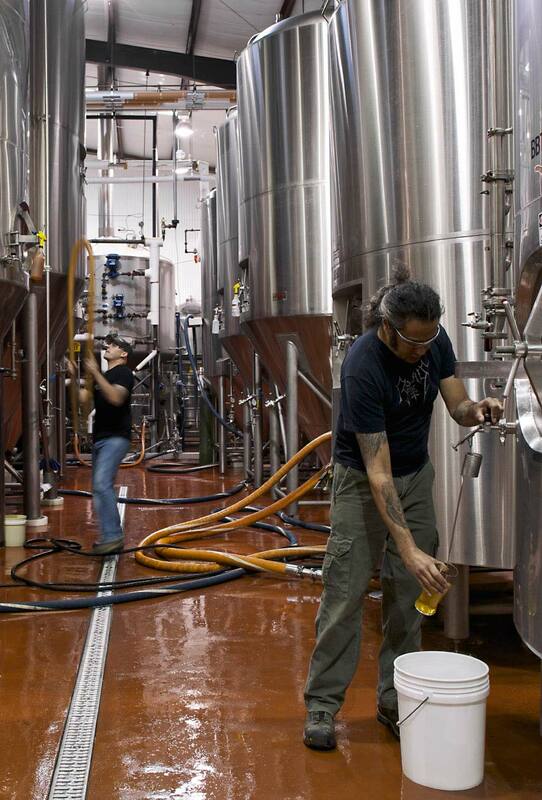 We currently average a daily output of 2,400 cases of bottles, 1,200 cases of cans, and 200 kegs. Yet for all the things we do to make our beer, we’re probably most proud of what we don’t do — processes like filtering and pasteurization. Want to learn even more about how we brew? Check out our free brewery tours. Real Ale isn’t just our name, it is a philosophy, a term deeply rooted in English brewing tradition. What’s real ale? Simply put, real ale is beer that is carbonated in the vessel from which it is served and dispensed without any extraneous CO2. It is also served at cellar temperatures (mid to low 50’s) instead of the tongue numbingly cold temperatures that have become the norm. The natural carbonation leads to a softer mouth feel while the warmer temperature allows you to taste the fine ingredients that we take the time to hand select. Since it takes specialized training to produce and dispense real ale, it came close to extinction. Thanks to the efforts of the Campaign for Real Ale (CAMRA) and later, the efforts of American craft brewers, real ale has made a strong comeback. We’re proud to keep this tradition alive and to help educate the public about these amazing ales. 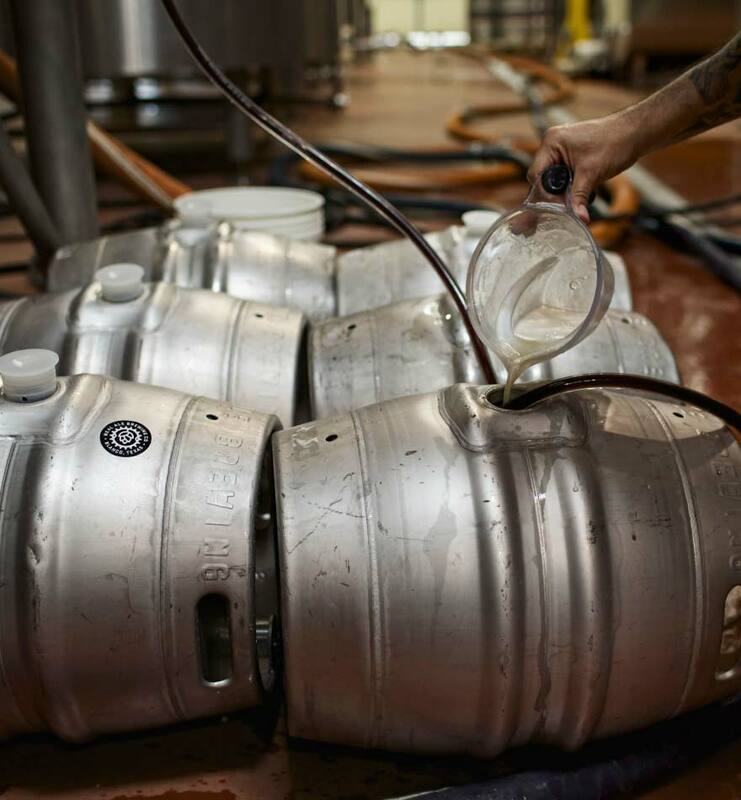 Make sure to ask for cask at your favorite bar and help spread the gospel of real ales. A state of mind. Existing in the space where our creativity is only confined by stainless walls and the staves of barrels. 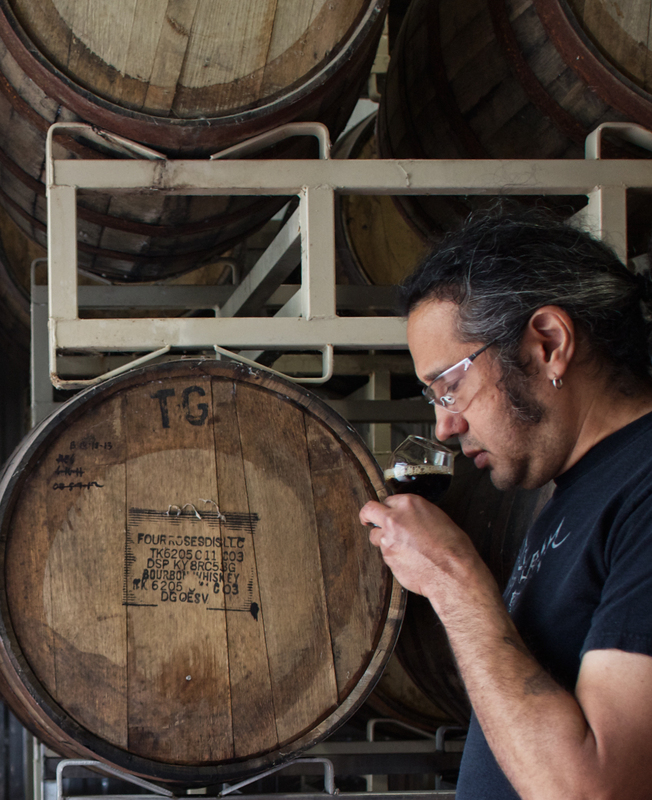 Working in harmony with Mother Nature and Hill County terroir, we have introduced a line of beers that both honor tradition and push the limits of the brewer’s art. There are a wide variety of ales produced under the aegis of Mysterium Verum. Some of these ales develop solely by maturation in oak barrels. The bulk of our barrels are American oak red wine barrels, but we use port and other spirits barrels when appropriate. In addition to barrel aging, we also have beers in the Mysterium Verum line that incorporate a secondary fermentation in wood. We utilize wild yeasts, some of which are indigenous to the brewery, and bacteria to produce acidity and other complex flavors in these unique beers. Mysterium Verum is a dynamic and growing program, which allows us to guide you through our ever-expanding frontier of beer.